Patent systems rely on a trade-off in which inventors are granted temporary monopolies over their commercialised innovations in order to incentivise innovation, in exchange for innovators disclosing the technical information that supports the diffusion of knowledge, in the hope of accelerating future innovation. This disclosure function has been labelled as the ‘quid pro quo’ to the right to exclude by the US Supreme Court. Despite the importance of this disclosure function, very little is known about whether the disclosure of technical information adequately serves the function of accelerating knowledge flows or future innovations. Theoretically, the complete and clear disclosure of technical specifications should stimulate future innovation by enabling follow-on innovators to benefit from the learning of prior inventors and by reducing duplicative experiments. Such disclosures have even been described as the potential building blocks of the knowledge spillovers that undergird economic growth (Romer 1990). Intellectual property attorneys have, however, raised considerable doubts about whether the theory accurately reflects patent practice (e.g. Roin 2005, Lemley 2012). Scepticism about the efficacy of disclosure rests on the prospect that clever drafters of patent documents can obscure key elements of the technology. They also argue that if the information that was required in a patent disclosure was, indeed, a primary mechanism for delivering value to potential competitors, IP lawyers would urge inventors to protect their innovations by other means, including trade secrets, which might limit the flow of information to future rivals. In addition, they note that many inventors actively avoid reading prior art, as doing so would increase the possibility that follow-on innovators may be found guilty of ‘wilful infringement’ of prior patents, which would carry the risk of treble damages for IP violations. Quantifying the value of patent disclosure for follow-on innovation is a core issue for innovation policymakers and is important for understanding the mechanisms that affect the rate of knowledge accumulation. The solution to this problem is made substantially complicated by the fact that because patent systems provide monopoly rights in exchange for the disclosure of technical information, it is difficult to separately understand the impact of one of these features separately from the other. Stated differently, the fact that the exclusion right and disclosure co-occur, empirical analysis cannot isolate the effect of the monopoly right on subsequent innovation (the ‘incentive effect’) from the impact of information provision via disclosure on subsequent innovation (the ‘enablement effect’). In a recent paper (Furman et al. 2018), we address this challenge by investigating the expansion of the USPTO Patent & Trademark Depository Library (PDL or patent libraries) system between 1975 and 1997. Over the course of these two decades, these patent libraries were the only locations other than the USPTO headquarters in Washington DC where inventors, attorneys, and the public could obtain access to the full range of information disclosed in patent documents or obtain access to search tools that enabled the review of prior art. Relative to the cost of accessing such documents and tools in Washington DC, we argue that the arrival of a patent library could substantially reduce the costs of accessing prior art for potential inventors in the geographic region close to that library. Because monopoly rights were national (and held across all geographic regions), the establishment of such patent libraries created potentially sizeable variation in the extent of ‘patent disclosure’ across regions during this period, as it proceeded the era of widespread Internet access. The USPTO patent library system was founded in the 1870s to provide patents and innovation-related resources for inventors, entrepreneurs, and incumbent firms. By 1975, 20 libraries had been established, primarily in New England and East of the Mississippi. Between 1975 and 1997, the USPTO embarked on an effort to open at least one patent library in each of the US states to increase the percentage of US citizens with a patent collection in their commuting zone. This goal was achieved in 1997, with the opening of 59 new libraries. We focus our analysis on this period of system expansion. Although we refer to patent library ‘opening’, establishing PDLs did not require the construction of new facilities. Instead, it required that existing libraries dedicated sufficient space, staff, and resources for patent library materials, and received official designation as a USPTO PDL. 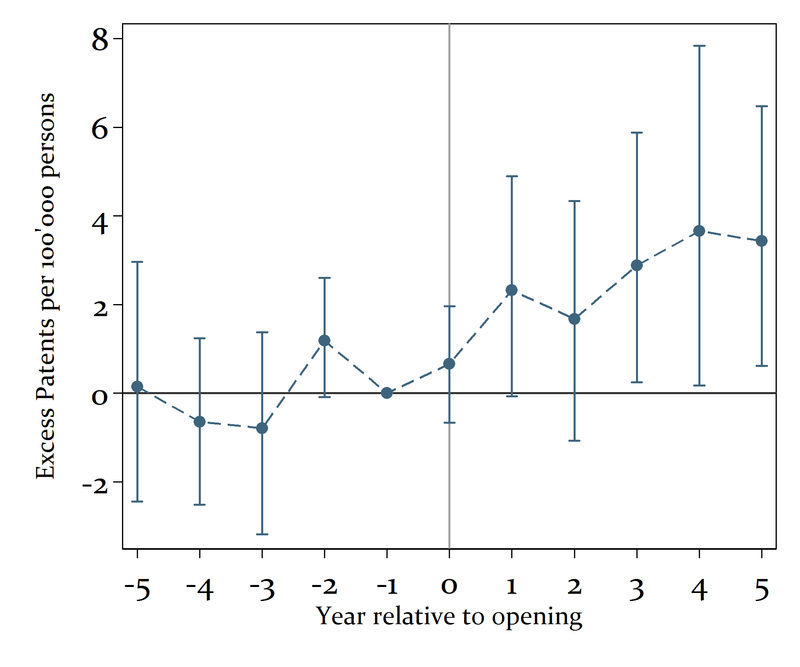 To estimate the impact of opening up a patent library on regional innovation, we compare the change in the number of ultimately-granted patents filed (by year of application) in the region of a newly-opened library with the change in the number of patents in the regions around a matched control sample of Federal Depository Libraries (FDLs). The 1,252 FDLs make government documents such as laws and Acts of Congress freely available to the public. As the missions of patent libraries and FDLs are similar, i.e., providing the public with official documents, nearly all PDLs are also FDLs. PDLs typically served initially as FDLs and only later became patent libraries, making FDLs in the same state a natural control group. Figure 1 identifies the Patent and Control Libraries and the set of patents granted in the regions around libraries in the our sample. Our ability to draw causal conclusions from our analysis depends on whether the number of patents in regions that received libraries would have followed the same trend as those of the regions around the control libraries. One potential concern about this identification approach is that in the period from 1975 to 1997, libraries could apply to become PDLs. As a consequence, our results could be spurious if the local librarian or the USPTO based their decisions regarding library opening on expected future patenting. While we cannot exclude this threat completely, we document that this is only a concern if the librarian submitting the application (or the USPTO) is able to correctly predict the exact year and place of an increase in future patenting of start-ups that are active in technologies where patent disclosure is important. We demonstrate that it is unlikely that concurrent shocks drive these effects. In the years before library opening, the number of patents per capita is similar in the regions around the control and to-be-treated libraries (see Figure 2). This is consistent with the ‘parallel trends’ assumption of differences-in-differences analyses. There is also no differential trend between control libraries, suggesting that the libraries do not simply relocate innovative activities from nearby regions. Our results are robust to the use of alternative control groups, including analyses using only ultimately-treated libraries, in which we use not-yet-treated regions as a control group. In additional analyses, we find three pieces of evidence that the mechanism driving the effect is most likely improved access to patented technical information. First, the effect is most pronounced in chemical technologies, for which patent disclosure matters most for follow-on innovation. This is consistent with prior survey research that documents the importance of patenting for these technologies, in which patents report valuable and specific knowledge that is, indeed, read by follow-on innovators. Second, inventors start to cite more geographically and more technologically distant prior art after a patent library is opened. After a library opening, inventors thus start to use knowledge that is less local and the geography of innovation becomes more dispersed as a result. This suggests that patent libraries facilitate the recombination of ideas across fields and contribute to like-minded inventors building on each others’ ideas. Third, we find that the effect is strongest after patent libraries introduced computer databases to search for prior art and that the effect vanishes after the internet made patent literature universally available and readily-searchable. This result suggests that simple trends are not driving the results and is consistent with the prospect that access to prior art is a key factor in explaining patenting patterns around patent libraries. To ascertain whether library opening affects economic outcomes other than purely via patenting, we examine data from the US Census on regional business dynamics. We find that Metropolitan Statistical Areas (MSAs) in which patent libraries were established experienced significantly greater rates of small firm entry and exit than did MSAs with comparable FDLs that did not receive such libraries. In addition, local job creation accelerated in regions with patent library openings and this effect was driven by new entrants. These results suggest that the impact of PDLs is not simply an artefact of increased patenting, but rather is consistent with the prospect that patent libraries affected local entrepreneurial environments. Our study demonstrates that patent disclosure contributes to subsequent innovation and that this effect appears only if patents are informative. We therefore contribute to the discussion on the benefits of patent disclosure and the merits of the patent system as a whole. Our evidence is consistent with the argument that a patent “serves to disseminate technological information, and that this accelerates the growth of productivity in the economy”. By finding particularly strong effects in chemical innovations, a technological area in which disclosure is thought to be particularly effective, our study also offers qualified support for critics that argue that the usefulness of disclosure through patents is limited and that the benefits of reading patents are mixed. Our empirical analysis shows the potential upside for innovation of more stringent disclosure. More generally, our study contributes to the literature on research-enhancing institutions by showing that investments in patent libraries helped to fuel regional innovation. Research-enhancing institutions lower the cost of access to useful knowledge and thus help to foster geographical and intertemporal spillovers on which economic growth is based. For example, biological resource centres, libraries of living organisms, can foster follow-on innovation by providing open and low cost access to life sciences research materials. In recent work, Biasi and Moser (2016) show that reducing the access costs to science books during World War I increased scientific output particularly in those regions in which libraries bought these books. 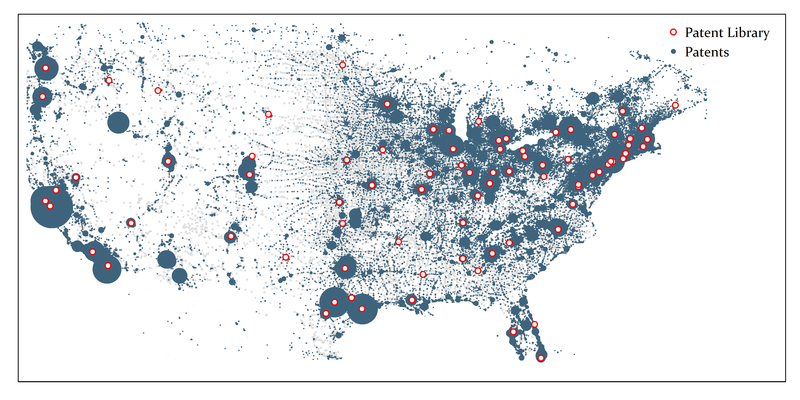 Our research contributes to this literature by showing that patent libraries increased innovation across US states by improving access to patent documents. Historical analyses of the US patent system have noted its role in democratising innovation, i.e. in enabling innovation to take root in various geographic regions, across socioeconomic groups, and among different types of enterprises. Our results provide evidence that, through its 1975-1997 Patent Depository Library programme, the USPTO continued to play a role in spreading innovation across regions and organisational types. In an age before the internet, searching patent documents at a close-by patent library provided an accessible way to study such prior art, especially for resource-constrained inventors. Furman, J L, M Nagler M Watzinger (2018), “Disclosure and Subsequent Innovation: Evidence from the Patent Depository Library Program” NBER Working Paper No. 24660. Lemley, M A (2012), “The myth of the sole inventor”, Michigan Law Review 110(5): 709–760. Roin, B (2005), “The disclosure function of the patent system (or lack thereof)”, Harvard Law Review 118: 2007–2028. Romer, P M (1990), “Endogenous technological change”, Journal of Political Economy 98(5, Part 2): S71–S102.